Casino Kay will score here and is not the morning line chalk. In fact she is the third choice in this race but in my opinion is the most likely winner on the card. This filly's win tour has stopped at HOL, SA and TP. With three stops ont he tour she looks to add Aqueduct to the latest Casino Kay win tour rockstar t-shirt. She has a race over the track where she closed on a speed favoring mud strip, tomorrow she goes 2nd time over the surface. The track figures to be to her liking and she is sporting a bullet work since then. She is a nice late card key to look forward to while you take in the mass at church. New Cable TV Show "Jockeys"
Looks like a fascinating new TV series for racing fans on the cable network animal planet. Maye this can convince that masses that racing is more exciting than team sports and more extreme than the X games. Can you think of a group that is more filled with lament than horseplayers? These people are angry and they will give you dozens of reasons to justify that anger. They have the nose beats on the wire, questionable DQ's that cost them a fortune, jockey error, mutuel clerk error, tracks ignoring their concern and high takeout. With all of this adversity it is easy for a horseplayer to justify a foul mood. Find a horseplayer within his domain at the track and a complain session can break out and any moment. This is why it is important for tracks to look like they care and to stroke their patrons. It looks like NYRA is on the right track with the introduction of the new VIP club for players that bet a modest amount. After years of disconnect between management and the patrons, slowly a relation is building between NYRA and its patrons. Opening a VIP club at a New York race track is not as easy as it looks. NYRA had proposed this VIP club within the track years ago but the NYSRWB blocked it over and over again to protect the government interests at OTB. Now that the club has finally been approved it is a step in the right direction for racetrack customer service. This shows that NYRA cares about customer service and is willing to fight against government corruption to ensure that it is taking care of their customers. 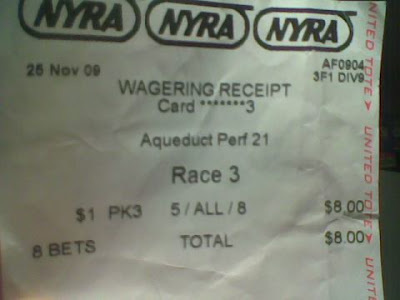 As someone that bets a modest $1000 a month on a NYRA rewards account I am eligible to be part of the club. This makes me feel good about going to the track. When I bring a non-tracky friend that has not been to Aqueduct he/she may now get the impression that the track is a place where they will take care of you and thay might even be under the false impression that powercap is an important big-shot. Horseplayers relish feeling like a big-shot, big-wig or big-cheese. This whole game of picking winners is a exercise in ego and stroking the ego is something that the track must try to do as much as possible for its patrons. For the track to expand its business the players must associalte the racetrack with their ego and how great they are at picking winners. NYRA has found a way to stroke everyones ego in a very economical way. Back in the old days(spring 2008 and earlier) the VIP room the "Sunny Jim room" was a simulcast area with dozens of TV and chairs where you can watch every race from Boston to California. The Sunny Jim did not have a unique role in the facility it was just like any other area where anyone could watch a race. 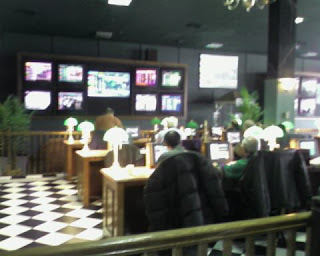 The modest improvements NYRA has made to the room is a new floor, new decor, a free continental breakfast buffet and dozens of workstations where the players have their own dedicated monitor/wagering terminal. With just modest improvements and a host controlling access NYRA has created the best place to play horses in the area. It is comfortable, you can drink all the coffee you can handle and there is a TV in front of you that allows bets up to when the latch pops on any race in the country. 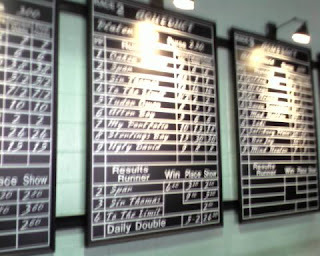 Any racing wagering facility should work on something like this to take care of their repeat customers. While other sports leagues are draining their customers with high ticket prices, there is a window of opportunity for racing to separate itself as a sport that cares for their patrons. Being considered a VIP is a validating experience that makes the horseplayer feel good about his handicapping and will even make losing a positive experience. Making horseplayers feel good will increase the likelihood that new horseplayers are recruited to the ranks and the game grows. Vegas has played this game for decades it is time for racing to get into the customer stroking game. In an industry where the participants are increasingly fighting for a bigger piece of a smaller pie it is vital that someone is growing the pie. NYRA is attempting to grow the pie. Most people that become a member of the NYRA VIP room will be inclined to become dedicated NYRA rewards horseplayers. This is the edge that the brick and mortar joints should exploit. Internet ADW's can not set up a VIP room in their patrons homes. A racetrack can do a physical stroking while the ADW is a distant entity far away. There are lights at the end of the racing tunnel. On Saturday I went down to Aqueduct for the afternoon. After handicapping the card I was looking forward to the seventh race where my key horse for the day was running. It was a bitterly cold day with temps in the teens and windchills near zero. A day where the trainers. grooms and jockeys earned every dollar they won. The wagering highlight of the day loomed in the seventh race, this is the race that would make or break my day. Saint Daimon had a great chance to win and would be a price. This was a great betting race on account that the odds on favorite had only a small chance to win and was being bet by the crowd due to some winning consecutive races at minor league Suffolk downs many months ago. Today the favorite Palmer's Approach was facing older stakes winners, real hard knockers many class levels above what he has ever faced, it is rare to find such a vulnerable heavy bet favorite in New York where the crowd is on-point so much of the time. Looking forward to the race and with so much of the bankroll riding on Saint Daimon I wanted to go to the paddock and eyeball the horses, especially since the key horse was running off a June layoff. Another reason for heading down there was to share some words of encouragement with my favorite jockey, the cagey vetern Jean-luc Samyn who has been riding in the New York area for 33 years. Samyn is a jockey that started riding before the opening of Giants stadium in New Jersey and will likely remain a local sports icon while Giants Stadium feels the sting of the wrecking ball in the near future. This is like Babe Ruth playing on while Yankee Stadium is destroyed or Julius Caesar outreigning the Collasieum. Samyn is a monument to self preservation and passion for the game, a Jockey who has been a stalwart of the circuit since the mid 1970's. Saint Daimon looked great in the paddock and Jean-Luc Samyn looked like he was freezing on his only mount of the day. When we called out to Samyn he looked strait ahead and ignored us. The race unfolded just like a suspected it would, Saint Daimon pressed the pace, outdueled the 3-4 chalk Palmers Approach and drew off in the lane to score at 9-1. Not only was it a great win but the price was tremendous especially in the multi race exotics. So when Jean-Luc Samyn guided Saint Daimon back to the winners circle me and my boy gave Samyn a warm welcome with shouts of "you the man" and SAMYN!!. Jean-Luc did not look up and acknowledge our calls. While were showering Jean-Luc with praise for not only setting up a huge score for us but for risking his life in zero degree weather another fan entered the area near the paddock. This other fan was just as vocal as me and my partner but had a different opinion. This gambler emerged from the grandstand like he was shot out of a cannon just as Saint Daimon was getting his picture taken. This gambler dispensed a verbal cluster bomb directed at Samyn and Saint Daimon. He was a working class Italian American man about 60 years old, reasonably dressed in casual slacks and a full head of hair dark hair. This fan exploded with a a barrage of obscenity launched at Samyn. The tirade was the verbal equivalent of a cluster bomb. This guy blasted Samyn with how he never wins a f*%3ing race (it was Samyns first win of the year), moved on to how everyone that bets on Samyn loses all their motherloving money, how Samyn is a f&%$ing stiff and it was about time that he got paid off from Samyn's f#^!ng mount. Samyn is 52 years old, just risked his life so we could make a huge score in brutally cold weather and he had to take a huge amount of verbal abuse when the race was over. The brutality of racing was on full display. Now I know why Samyn does not engage with the fans at the Big-A. The abuse from the degenerates is raw, powerful and mean. Right then and there I understood why racing can not attract a big crowd on a non-tv race day. If malls are roamed by poodles, baseball games attended by Boston Terriers, football fans are mutts, racing is attended by Pit Bulls. The most dangerous of dogs. The racing fan degenerates are brutal and it is frequent public verbal tirades that keeps the upstanding type people far away. I really felt bad for Samyn after absorbing that abuse, but as someone that has been at the track for decades I am sure he took it in stride as part of the game. Racing is real and the and the bad is not euphemized and hidden away. While this rawness may be unique it is not a huge selling point prompting the masses to pour into the track. With the first running of the Evening Attire Handicap at Aqueduct tomorrow here is a word about Evening Attire from the only trainer he ever knew. We don't play on Tuesday to lets make up for it with a two-fer Thursday dutch play. One pick is a miserable chalk who will properly pay $2.80 but is such a lock that I might as well endorse her just to bring up the win the win percentage. The other is a bomb with real shot who will pay over $40 if she gets to the wire first. The chalk here Seventh Street is absolute lone speed. She should be as loose as she wants to be and if the track is anything like it was yesterday she should be long gone. Wednesday's speed bias was powerful with the cold temps and wet track. The filly that finished right behind her returned to win yesterday. Take the short price on this filly or sit on your hands. In a field completely lacking speed Sassification is a filly who could be loose on the lead at 20-1 or more. She returns quickly after racing on a very tiring track last Thursday. That race had a few other front runners entered, this race has none and she drops in class. Check out her recency, she sports a work Monday morning and a race 7 days ago. Combine the recency, the drop in class and pace profile and this is a powerful key at a huge mutuel. With these two picks back to back there are all sorts of exotic possibilites in the daily doubles, pick 3's and pick 4's. Here is an interview with Hall Of Fame Jockey Eddie Arcaro from September 8th, 1957. Back then flat racing was the top sport in the country and Arcaro was the boss Jockey. Arcaro's position in the jockey pecking order reminds me of Jerry Bailey of the 1990's- early 2000's minus the ladders. Some of the things that Arcaro talks about reminds me of when Bailey rode in New York from 1996-2005. Jerry Bailey would dominate the betting with his mounts always attracting more money than they deserved. Who can forget the New York boo birds coming out in full force whenever Bailey lost. Seems like Arcaro dominated like that in his day and dealt with the same issues as Bailey. Enjoy the interview. Enjoyed the racing at Aqueduct on New Years day. Picked up a few calenders and introduced a few new people to the game. Good thing there were plenty of calenders in the house because they needed them to time the races. Check out some of these times; One mile in 144 1/5th, Dr. Fager could have been unsaddled and on his way to the spit barn inside of that time. Six furlongs in 115 and 2/5ths, I didn't know they could run 61/2 on the inner. Even the stakes race featuring Grade II winner Zada Belle finished up 113 and 4/5ths which is four seconds slower than her last win. What was the cause of these bizarre slow times? Was it the wind or some new post snow track maintenance? Whatever it was that caused the slow times on Friday must have been eliminated. The race times on Friday were in line with thoroughbred race horses and not elderly people pushing shopping carts. The DRF variant should be 45(very slow) for this day. Yes it was cold and windy but cold does not mean slow. Going into the day I usually presume that speed is going to dominate on a brutally cold day where it is 25 degrees Fahrenheit. To my surprise and to the detriment of the early wagers speed did not dominate. This was a fair racetrack. All run styles claimed a bit of the pie as early pace, pressers and deep closers all won races. It seemed that the two turn races had a closer bias as the speed horses were not only losing but staggering home eased up in the lane. Deep closers won three of the four two turn races. Looking at the charts the most impressive winner was in the 7th race. The winner Understatement ran a relatively snappy six furlongs in 113 and 3/5ths. This N1X allowance going 1 1/16th had a six furlong split that was faster than the stakes race that went in 113 4/5ths 25 minutes later. Would it be an overstatement if someone stated that Understatement is ready to realize the promise of his huge purchase price? I am going to list him in the stable mail as he did do something somewhat impressive on New years. I am somewhat apprehensive about expecting speed horses to run two big races in a row, but this horse is somewhat fresh, this is the inner track and Todd Pletcher should be able to keep the form rolling for at least two races before the we reach the top of decent in Understatement's form cycle. Today is the first day of the second full year of Powercap. It has been a full year since we started publishing our thoughts, power plays and semi-offensive rants for the racing world to enjoy. Today we have a play of the day as we begin the climb back towards profitability. Class looms large in these low level lightly raced claiming races and class is one of my trusty angles. #5 Dakota Bob finds himself one of two open company horses in a field of NY breds. In addition he is the only multiple winner in the field and is not the morning line favorite. I think the morning line of 7-2 is a very real possibility and if we can get 3-1 that is a gift. Dakota Bob should be well rested after a win at Meadowlands and the low profile connections will work towards ensuring a fair price. Dakota Bob makes it three wins while everyone else in the race remains at one.